Assam Chief Minister Sarbananda Sonowal has instructed his ministers to visit flood-hit districts and supervise relief and rescue operations even as there are reports that over 16 lakh people have been affected by the floods in 21 districts of Assam.Assam State Disaster Management Authority (ASDMA) officials said the flood waters have inundated close to 3,000 villages in these districts affecting 16,68,865 people and forcing 1,12,856 people to take refuge in 472 relief camps.According to the ASDMA officials, 21 districts -- Lakhimpur, Golaghat, Bongaigaon, Jorhat, Dhemaji, Sivsagar, Barpeta, Kokrajhar, Dibrugarh, Goalpara, Tinsukia, Dhubri, Morigaon, Sonitpur, Biswanath, Darrang, Nalbari, Baksa, Udalgluri, Kamrup (M) and Chirang -- have been reeling under floods due to heavy rainfall in the upper catchment areas of Arunachal Pradesh and Bhutan. "With reports pouring in that flood affecting new areas, the ASDMA has opened a control room with phone numbers 1070, 1079 and 0361-2237011 for any assistance," the ASDMA officials said. 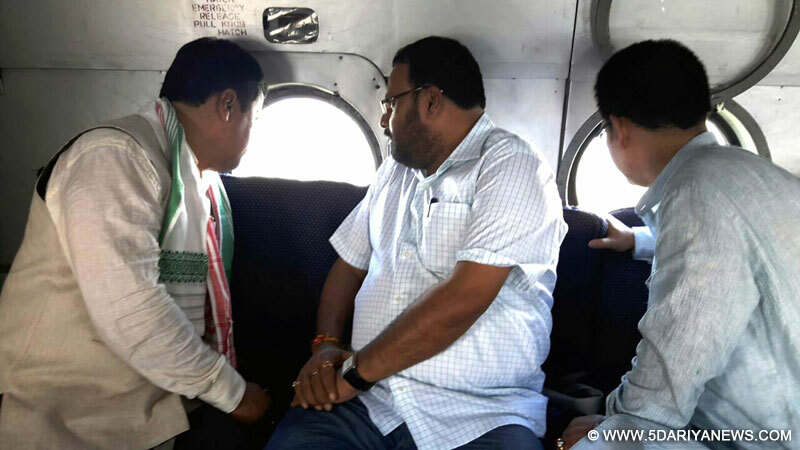 Considering the deteriorating flood situation, Sonowal has instructed Water Resource Minister Keshab Mahanta to visit Barpeta, Morigaon and Nagaon. Agricultural Minister Atul Bora will visit Golaghat, Sivasagar and Jorhat while Irrigation Minister Ranjit Dutta will tour Sonitpur and Biswanath. Panchayat Minister Raj Naba Kumar Doley will visit Majuli, Lakhimpur and Dhemaji and PWD Minister Parimal Suklabaidya will go to Dibrugarh and Tinsukia.PHE Minister Rihan Daimary will visit Udalguri, Baska, Chirang and Nalbari. Forest Minister Pramila Rani Brahma will go to Bongaigaon, Kokrajhar and Dhubri.Labour and Employment Minister Pallab Lochan Das will visit Darrang, Kamrup (R), Goalpara and South Salmara districts. "To provide succour to the affected people, relief has been distributed in all flood affected districts. Funds for providing relief have been placed with the district administrations in advance. NDRF, SDRF and the Army are helping the district administration in evacuating the affected population," said the ASDMA official.The officials said SDRF teams with deep divers have also been attached to the 27 fire stations of the state to respond to any situation.